The Kuhn GMD 8730 FF is a rear-mounted triple disc mower that delivers a clean cut with a wide cutting width. 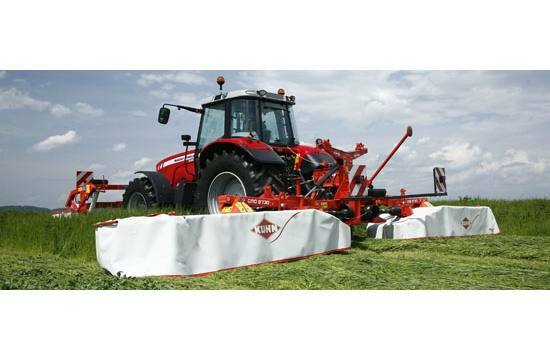 This mower provides high reliability and quick cutting to help produce quality forage at a high output. Each mower has a low, smooth cutterbar profile (and computer-designed discs) to ensure a close, consistent cut. Farms that have larger areas to harvest are in need of a large capacity machine, such as the GMD 8730. This machine combines the strength and durability of the “lubed-for-life" Optidisc® cutterbar, the simple, precise ground adaptation of the Lift-Control® suspension system, and the heavy-duty, yet lightweight support of the high-strength steel frame. Designed for use with the GMD 802 F-FF, this mowing unit will cut up to 28'7" using as little as 120 PTO horsepower. The Fast-Fit® blade retention system allows the operator to quickly change blades with the use of a simple tool, yet still achieve the optimum cut quality and blade life seen with the standard system. Working width: 28 ft.7 in. Transport width: 9 ft.9 in.